Poncho Lowder Portland, OregonPastor Poncho & Lora Lowder are the Lead Youth Pastors of Generation Unleashed, the ministry to 12-24 year-olds at City Bible Church. Pastor Poncho has given himself to preaching and teaching the Gospel, locally and internationally. His message of purpose, passion and prayer have compelled thousands of young people to know God. He oversees the Generation Unleashed Conference and teaches at Portland Bible College where he received his bachelor degree in Theology. With the fast pace of our culture today, people struggle more than ever developing a daily relationship with God. And, often, those who do have a daily time with God may find themselves doing it out of duty rather than a personal relationship with Him. 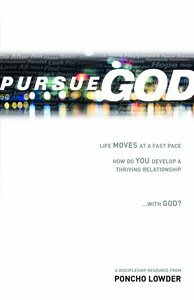 Pursue God helps readers develop an authentic daily relationship where they are inspired to pursue God. First, by discussing “Why” to pursue God, and secondly “How” to effectively pursue Him. Poncho Lowder | Portland, Oregon Pastor Poncho & Lora Lowder are the Lead Youth Pastors of Generation Unleashed, the ministry to 12-24 year-olds at City Bible Church. Pastor Poncho has given himself to preaching and teaching the Gospel, locally and internationally. His message of purpose, passion and prayer have compelled thousands of young people to know God. He oversees the Generation Unleashed Conference and teaches at Portland Bible College where he received his bachelor degree in Theology.